Every year approximately one-third of the food-produced globally for human consumption goes to waste. This amounts to approximately 1.3 billion tonnes! Food waste generates 3.3 billion tonnes of greenhouse gases. Reducing food waste is the third most effective way to tackle climate change. The UN estimates that if farmers globally fed their livestock on food waste and on agricultural by-products, enough grain would be liberated to feed an extra 3 billion people, more than the expected population by 2050. UK companies have a Duty of Care to operate according to the principles of waste minimisation. This is set out in 5 steps known as the waste hierarchy. 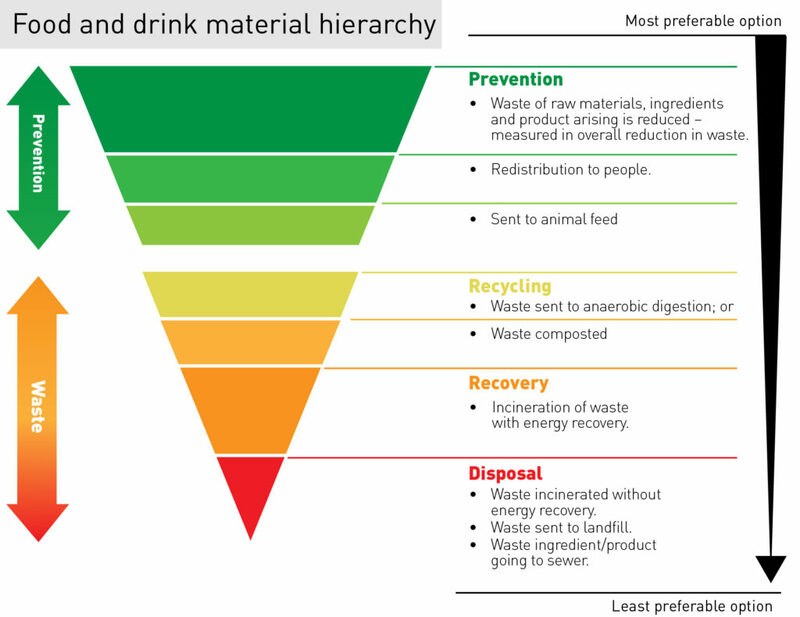 WRAP produced the below Food and Drink Material Hierarchy to make the waste hierarchy easier to use for businesses in the food and drink sector. As shown above, the most preferable option is to prevent food from becoming waste in the first place. If this is not possible, the next best option is to recycle; either by sending the waste to anaerobic digestion; or to compost the waste. PRM offer a range of solutions to help reduce the amount of food waste that will end up in landfill. For commercial food waste producers, we offer the PRM Bio-Processor, capable of reducing the volume of food waste by up to 80% in as little as 24 hours. Inside, waste is broken down aerobically using tiny microbes, affectionately known as ‘Little Pigs’. More formally, this process is controlled by Jem Adaptive Logic ™ which intelligently maintains a unique blend of microbes specially optimised to break down your organic materials. This allows for highly effective, robust and efficient operation. We offer a range of sizes, from the compact bin-sized machine to the largest in the range capable of holding up to 1000kg of food waste. Because the volume of waste is reduced so significantly, your bin lifts can be too. We found one of our sites reduced their bin lifts from 15 per week to 3! Reducing their carbon emissions, by reducing their transport requirements. This food waste depackaging machine separates organic waste from its packaging, without water and without grinding – whatever the type of packaging or organic matter. By removing the packaging from food residues, FlexiDry recovers the fermentable fraction of waste that can be turned into biogas and fertilizer. FlexiDry processes all types of packaging. The recovered organics presents close to 0% contaminants and up to 99% of the organic matter is extracted. The process relies on low energy consuming mechanical actions and requires no water addition. The Runi depackaging machine is highly effective at separating liquid from its packaging. The resulting packaging is significantly reduced in weight and volume and the liquid is put to use as an additional, valuable feedstock in the AD plant. For material where packaging is not a concern, the Vincent screw press excels in dewatering fibrous material. This equipment also has a long history in the citrus industry for processing citrus peel both to produce animal feed and pectin peel. Vincent presses are utilised in the processing of food waste where the press separates water (press liquor) to be treated or disposed of and the solids (press cake) to be reduced in weight and volume. Need advice on managing your food waste? To find out how we could help your business contact us here.